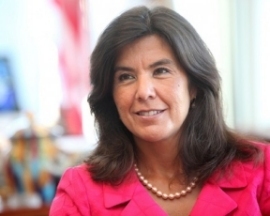 Cook County State’s Attorney Anita Alvarez has been named Latina Lawyer of the Year by the nation’s largest professional Hispanic bar association. State’s Attorney Alvarez accepted the award today at the 40th annual convention of the Hispanic National Bar Association which is being held in Boston. The Latina Lawyer of the Year award is presented by the HNBA in recognition of professionalism, character, vision and leadership in addition to contributions to the legal and Hispanic communities. The first woman and Hispanic elected to the position of Cook County State’s Attorney, Alvarez is being recognized for her “extraordinary achievements in the legal profession and her strong record of accomplishments as State’s Attorney on behalf of victims of crime.” The Hispanic National Bar Association is a nonprofit national membership organization that represents the interests of Hispanic legal professionals in the United States and advocates on issues impacting the Hispanic community.